OSHA’s provided its explanation in a Letter of Interpretation (LOI) in response to a question from an official with State of Washington Department of Agriculture. Steve L. Foss, a WSDA program specialist, asked OSHA officials whether commercial fertilizer products, minimum-risk pesticides, and spray adjuvants, intended for agricultural or commercial use, are subject to the labeling requirements of the hazard communication standard. The U.S. Environmental Protection Agency (EPA) is responsible for regulating pesticides under the Federal Insecticide, Fungicide, and Rodenticide Act (FIFRA). Most agricultural, commercial, and consumer pesticides must be registered with the EPA. However, certain “minimum-risk” pesticides are not subject to EPA registration requirements but still are subject to FIFRA labeling requirements. Minimum-risk pesticides include substances such as citric acid, corn gluten, garlic, and mint oil. 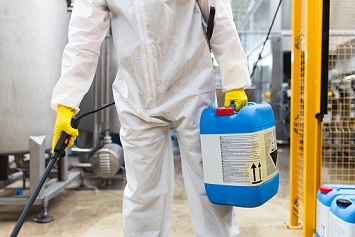 OSHA explained that because fertilizers, minimum-risk pesticides, and spray adjuvants are subject to the EPA’s labeling requirements under FIFRA, they are not subject to OSHA’s labeling requirements under the hazard communication standard. However, the hazard communication standard does require that safety data sheets (SDSs) be prepared for fertilizers, minimum-risk pesticides, and spray adjuvants. OSHA officials also pointed out that consumer products and hazardous substances covered by the Consumer Product Safety Act (CPSA) and Federal Hazardous Substances Act (FHSA) are exempt from the hazard communication standard’s labeling requirements. Labeling requirements for consumer products and hazardous substances under the CPSA and FHSA are set by the Consumer Product Safety Commission. Any of these products being transported—consumer products, hazardous substances, and pesticides—also would be subject to placarding requirements under the federal Hazardous Materials Transportation Act. OSHA also pointed out that Washington is a state-plan state with its own workplace safety and health laws and regulations. Currently, 26 states and Puerto Rico and the U.S. Virgin Islands have their own workplace safety and health programs. Under the Occupational Safety and Health Act, the standards in a federally approved state-plan program must be “at least as effective” as the federal standards. OSHA typically funds up to 50 percent of the operating costs of state safety and health programs.